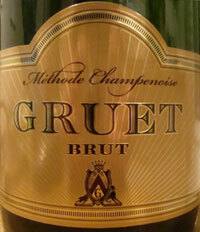 Gruet Winey makes some very nice and affordable sparkling wines in what seems to be the unlikely area of New Mexico, near the city of "Truth or Consequences." As surprising as this may seem, some areas of New Mexico may be an ideal area to grow grapes: Gruet is located at 4300 feet above sea level and the days are very hot but the nighttime temperatures drop up to thirty degrees. This cools the grapes and extends the growing season. The grape crop is consistent every year, there is no humidity hence no possibility of rot, and the soil is sandy loam with excellent drainage. This all adds up to a wonderful place to grow grapes, and the proof is in the bottle. The story begins when Gilbert Gruet of Bethon, France, already in the wine business and the creator of a wine coop in Bethon as well as producing Gruet et Fils Champagne since 1956, was touring the Southwestern US with his family in 1983. He met Europeans who were successfully growing grapes in New Mexico (which has 25 wineries now) and he was intrigued. The land was cheap as compared to Champagne where land was and still is very expensive. The Gruet family bought a vineyard near Elephant Butte Reservoir by the city of Truth or Consequences (where totally unrelated, my friend Amanda was recently stranded for days - perhaps the Universe wanted her to stay and make wine but she didn't listen?). Gilbert's son Laurent and daughter Nathalie moved to New Mexico to manage the new winery, shipping equipment from France, with a goal of producing sparkling wine by the méthode champenoise. They planted Pinot Noir, Chardonnay, and Pinot Meunier (since replaced by Chardonnay) and the rest is history. They grow their wines organically and buy 20% of their grapes from others, with a goal of eventually only using their own grapes. Grapes are hand picked and shipped by refrigerated truck to the winery 3 hours away. They make several still wines, including 2 Chardonnays, 2 Pinot Noirs, a Syrah, and a Chenin Blanc, but they are best known for their sparkling wines. According to their Web site, they produce "seven different sparkling wines: Brut NV (non-vintage), Blanc de Noirs NV, Rosé NV, Demi Sec NV, vintage Blanc de Blancs, vintage Grand Rosé, and the Gruet Winery's luxury tête de cuvée — the vintage Gilbert Gruet Grande Reserve." They are expanding as well. And I will be trying more of their wines and reporting here. Another impressive wine from Gruet, even ignoring the price (about US$15). I like this just a little better than the Brut, although both are wonderful. Yellowish color with perhaps a definite slight ting of orange and amber. The nose has red berries, some chalky minerals. With air, some white fruits emerge under the minerals: apple and pear. Quite mouth filling with some red berries, a little bit of orange, and very cheerful and bright tasting. Extremely well balanced. A very fun and tasty sparkling wine! This is their best seller, and I would easily love it at twice the price or more! The nose has minerals and orange citrus peel, and some pear and apples under the minerality. Flavors of pear and apple, and a slight syrupy quality which dissipates as it breathes. This is very very nice, and a hell of a deal at maybe $US15. I might like the nose slightly better than the palate. I'll be buying more of this! AWESOME DEAL!